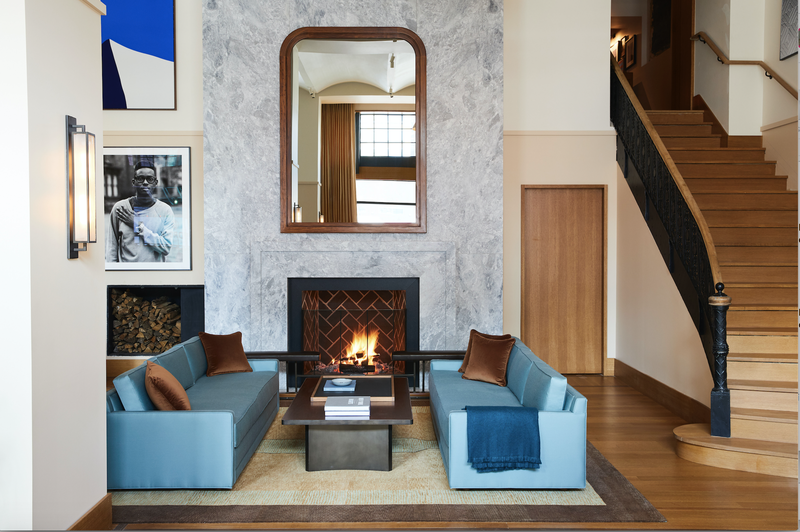 Two Detroit powerhouses—luxury goods retailer Shinola and real estate firm Bedrock—have teamed up to craft an elevated hospitality experience. With reservations now open for dates starting in the New Year, Shinola Hotel is a stunning new addition to Motor City’s historic Woodward Avenue shopping district and promises to quickly become a bustling place where food, design, and retail converge. Utilizing two restored historic buildings (T.B. Rayl Co. department store and a former Singer sewing machine store), as well as three additional constructions, the boutique hotel is operated by hospitality firm Mac&Lo and includes design by Gachot Studios and Kraemer Design Group, in addition to products made by Shinola exclusively for the space. Throughout the interior, warm earth tones meet brighter pops of turquoise and orange, with mid-century shapes combined with elevated textures like linen, velvet, and marble. Several food ventures, overseen by chef Andrew Carmellini of NoHo Hospitality Group will include a beer hall, a cocktail bar, a wood-fired pizza restaurant, and a fried chicken spot. In addition, banquet halls will provide spaces for events, and retail spots will house stores like Le Labo, Good Neighbor, and some soon-to-be-revealed local brands. Already, the hotel looks like a dream destination for both locals and travelers alike, and it’s primed to quickly become a space where creativity and innovation thrive—especially when helmed by such an abundance of local talent.